Dr. Washington Wentworth Sheffield was born in North Stonington, Connecticut. After graduating from dental college, he worked in the practice of Dr. J.A.G. Comstock of New London, practiced briefly in New York City and then returned to New London, where he changed the future of dental care. Taking advantage of his skills as a dentist and chemist, Dr. Sheffield, in 1850 at the age of 23, invented modern toothpaste. Prior to his invention, oral care consisted of applying various tooth powders and antiseptics to one’s teeth and gums. 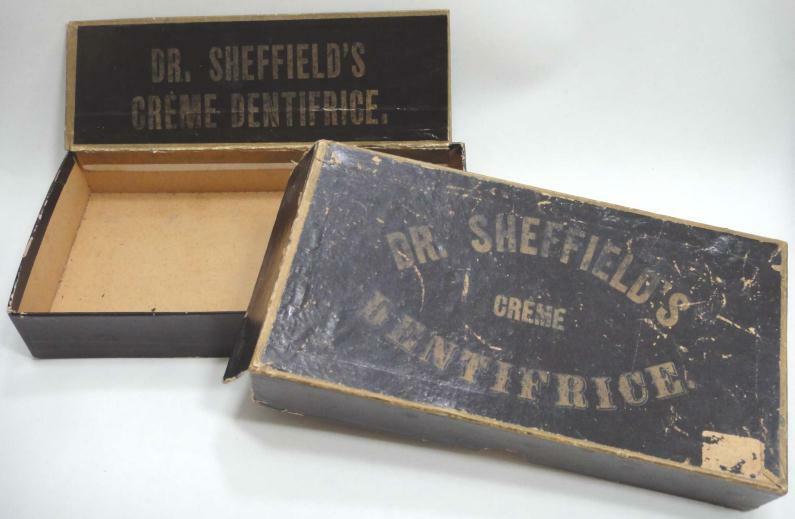 Starting his Sheffield Dentifrice Company in 1850, Sheffield created a new way to care for teeth. 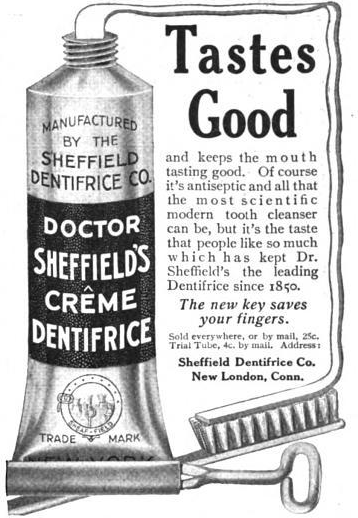 When combined with his Elixir Balm, Sheffield’s invention claimed to remove or prevent “tartar and other affections.” The Sheffield Dentifrice Company promoted their toothpaste as “the aristocratic dental cream” and a product “which arrests decay, checks infection and keeps the oral cavity sweet and pure.” Growing demand for the product—which Sheffield named crème dentifrice—brought about the construction of a small lab at 170 Broad Street in New London for the purposes of mass production. A toothpaste for the emerging consumer market was but one of Sheffield’s contributions to the field of oral hygiene. In the late 19th century, numerous companies flooded the toothpaste market with products available in a variety of different jars—into which all members of a family might dip their brushes. During this time, Washington Sheffield’s son, Dr. Lucius Tracy Sheffield was in Paris, France, where he noticed artists using collapsible metal tubes for paints and inks. Lucius communicated his observations to his father and shortly after, in 1892, Washington Sheffield unveiled America’s first toothpaste tube. Taking all manner of manufacture under his own control, Dr. Sheffield began producing tubes made out of tin. He built facilities for printing and embossing the tubes and even manufactured the boxes for shipping them. His two grandsons took this idea a step further when they formed the New England Collapsible Tube Company in 1911—an enterprise that became the largest producer of collapsible tubes in the country. The company Washington Sheffield started is still in business today under the name Sheffield Pharmaceuticals. Still located on Broad Street in New London, it is in the business of making creams, ointments, and pastes for the medical and dental fields. In addition, it still makes its own formula of toothpaste, along with manufacturing toothpaste for such widely recognized brands as Colgate. Marshall, Benjamin Tinkham, ed. A Modern History of New London County, Connecticut: Includes Biographical. Vol. 2. New York, NY: Lewis Historical Publishing Company, 1922. Link.